Although there is one bedroom, this place is far from confining. There is a huge private yard, a Screened Porch, deck or a private pier to relax on. A fire pit is on site. Pets considered. This cabin has one QUEEN SIZE bed, one sleeper sofa, and a kitchen with all utensils included. Free use of wireless internet. You will also have your very own private pier to do a little fishing or just for relaxing. This is a very safe environment to just even get away for sometime alone, or for Mom and a couple of friends to relax and get away from it all. The Towne Country Club is just 5 minutes away and open to the public for golfing on a beautiful course, with a couple of the holes designed by Edgerton native, Steve Stricker. Also, Edgerton has a great Aquatic Facility for relaxing around the pool on a hot summer day. You might want to take a stroll across the bridge and have lunch at Off The Hook Grub/Pub , The Showboat Tap, or The Edgewater Cafe. Pick up some bait and supplies at Treps Bait Shop. This is a great place to just watch the world go by. Also great fishing for walleye in April and May, up and down the river and at the dam. The location of the cabin and the accommodations provided made it a great place to relax for the weekend. We loved sitting around a camp fire right next to the river! There are also great nature preserves and wooded trails within 10-15 minutes driving distance that we took advantage of. We had a great time at the cottage! The accommodations and views were wonderful. Very quiet and peaceful. The rock river was beautiful in the wintertime! I have just returned from a week stay at this cottage and it was just what I had been looking for: small, quiet, cozy place with a fireplace, surrounded by snow, unfortunately I didn't get the snow until yesterday. It was an enjoyable stay and I love that I could bring my dog. George keeps many bird feeders full so I pulled my chair close to the patio door and watched a redheaded woodpecker, cardinal and snow birds feast. The ducks stay close to the dock waiting for corn kernels to be tossed to them. I missed the elusive eagles but plan on going back next year for another week of R&R and hope they show. Thank you Chris and George for sharing your cottage. Thank you for a wonderful stay! Snow and river was great! This was our second time enjoying the cottage on the river. 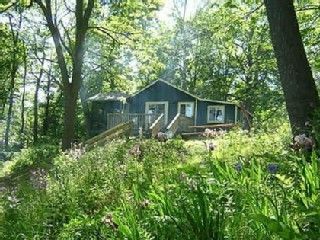 The cottage is very welcoming and a wonderful place to enjoy some downtime. The cozy sitting room allows you to either watch some TV or enjoy the sights on the river through the patio doors. We visit in the winter time but can’t wait to book a trip during one of the other 3 seasons to take advantage of the screened in porch and surrounding private land. Thank you again for providing a great, private getaway. Summer rentals: Either Fri-Mon, Mon-Fri or Fri-Fri Check in after 4pm-check out 10:30am (Fridays) Weekends Fri-Mon( chkout noon) Holidays of Memorial Day, July 4th, and Labor Day - 3 nite minimum- 200.00 per nite-unless renting for the full week of Friday to Friday. Then weekly rate applys. Holidays of Memorial Day, July 4th, and Labor Day- 200.00 per nite(unless renting for a full week-then weekly rate Holidays 3 nite minimum The charge of 105.00has a 3 nite minimum during the week(off season rates) Pets considered KAYAK RENTALS Owner does all their own bookings call or email for any rate/length of stay exceptions, and off season rates.